Nestboxes come in all shapes and sizes. But what are all those odd shapes for? What exactly do you look for in a good nestbox? Wood is more natural to what birds use in the wild- actual tree cavities. It is insulated, chewable and not too dark (studies have shown that chicks don't like boxes painted pitch black). Wood boxes are made from plywood. If you breed the larger species like macaws, you'll end up using actual tree trunks (usually palm cut with a chainsaw). What's bad about wood? Not much other than it is difficult to disinfect. Metal boxes are very temperature sensitive. If it gets too hot, your eggs and chicks can cook inside. Birds can't destroy them. 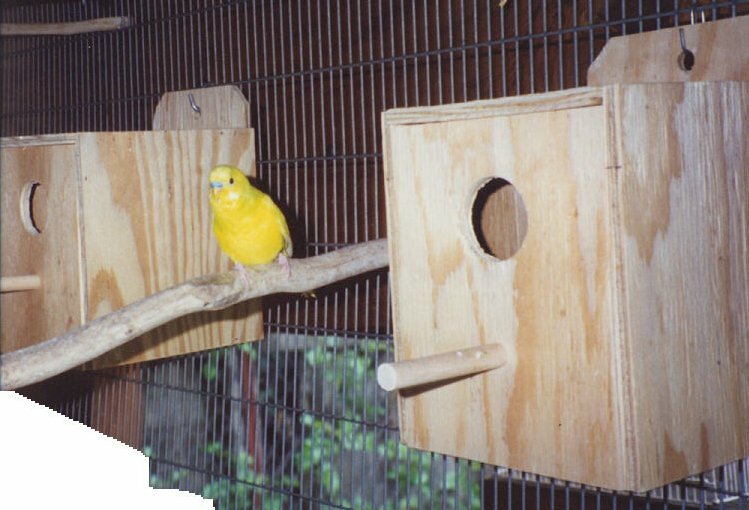 This is beneficial when keeping large parrots, who can reduce wood boxes to splinters. If you have a temperature-controlled environment and want something indestructible and easy to clean, metal boxes might be for you. This is the box used for most smaller species: budgies, cockatiels, lovebirds, etc. You shouldn't have to make your own; these are sold virtually everywhere (in corresponding sizes). Some come with perches or a ledge out front. Neither is required but they can be helpful to the parents. Others come with a "front porch" where the sides are extended to obscure neighbors from view. Boxes are either designed to hang on the inside of the cage or the outside. Inside hangers (like mine) have the back wall as the tallest. The lid is hinged at the back and opens at the front near the door. Outside hangers have the front as the tallest wall. Their lid is hinged at the front and opens up near the back. The tallest wall containes a small hole drilled for use in hanging. Always pay attention to which style you are buying. You don't want to get home and realize you can't hang your box. This type is designed for nervous pairs. The depth of the box should make them feel more secure. The ladder on the way down (which all tall boxes should contain) is there to keep pairs from diving in and smashing their eggs. The boot end is where the eggs are supposed to be laid, further avoiding injury from frantic parents. Unfortunately, some pairs lay their eggs straight at the bottom and don't use the ladder on the way down. If your pair is nervous and a boot box still isn't helping to keep the eggs safe, try a "Z" box. This box (not pictured) is shaped like a "Z." The design forces the pair to walk diagonally down before accessing the nest area. The "T" box is specifically designed for cockatoos. In some pairs the male will try and trap the hen inside the box. The two holes are to help facilitate her escape. I'm not sure how well this design works though. It seems to me that a male could easily patrol both exits. This is for the big guys- macaws and hornbills mostly. Macaws would demolish plywood boxes. Nestboxes of this design are usually made from palm tree trunks, hollowed out with a chainsaw, trashcans or metal. How big should the entrance be? It should be a tight fit, but accessable. My friend Jaynee once caught a ringneck hen inside a budgie nestbox left in the flight. The hen had gotten in by dropping one wing and squeazing in. Naturally you don't want the hold that tight, but it should be snug. Look at the photo for an idea. In a colony, they should all be hung at the same height. Also hang them far enough apart to avoid conflict. This is a distance you'll have to gauge from observation and experience. Always offer more boxes than you have pairs and give them a selection of styles. 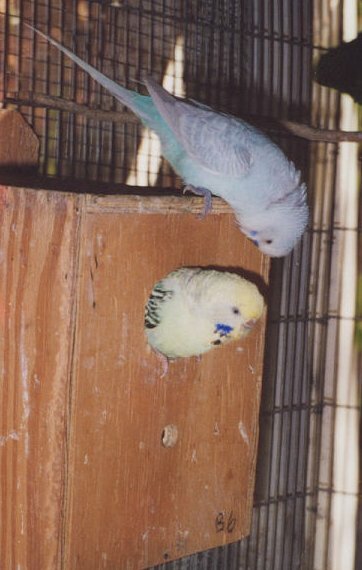 I breed budgies, tiels and kakarikis in mixed colonies. Each flight has an assorment of budgie and lovebird boxes, some without perches, and maybe one cockatiel box. Inside each box place a small layer of pine (NOT cedar) shavings (for lovebirds, offer leaves and clean strips of paper for nesting material). Mostly likely this first layer will be kick out. This is fine and even good (you'll know your pair has been into the box). Birds reuse nesting cavities in the wild and cleaning is often required. They don't want anyone else's poopie, germ-filled bedding now do they? Once the chicks have hatched you can try adding shavings again. They will help absorb the feces and need to be changed every so often. Some hens will still chuck the shavings. In this case, keep the box extra clean and watch the chicks for splayed legs. Boxes should be check daily, even when not in use yet. You want the pair to get used to your intrusions! If a bird is inside, gently tap on the lid to give them warning. If they do not exit, you can crack open the lid slowly, giving them time to get out. Some birds will stand their ground and how they act often depends on their upbringing. Handfeds can be very hostile because they are not frightened of humans. Many birds will exit if you poke your fingers in (or bite, use a stick to poke around a biter's nest). Many will continue to guard the eggs but can be gently poked to the side to view them. Some of my hens let me pick them up, look at the eggs and set them back down.